The Jacksonville Jaguars are running out of options. It's not that they haven't tried different things to end their losing ways. A couple weeks ago, Jaguars head coach Doug Marrone said the team was going back to the basics, the fundamentals in their daily practices, with the hope of improving their production. It didn't help. Last week, defensive captain Calais Campbell called a players-only meeting where players were given a chance to voice their displeasures, their concerns, their thoughts about how the team could get better. It didn't help. The latest fall-back measure that the Jaguars are hoping will work? Their bye week. Jacksonville is off this week, which means it can't add to its current four-game losing streak. A year ago at the halfway point of the season, the Jaguars were 5-3 and in the middle of a four-game winning streak, on their way to a 10-6 season and berth in the playoffs. What has everyone mystified is that there have been relatively few changes in the starting lineup this year from the 2017 group. There were two changes on the offensive side -- guard Andrew Norwell and tight end Austin Seferian-Jenkins are new starters this season. Defensively, the only change was to replace veteran linebacker Paul Posluszny with rookie Leon Jacobs. That means 19 of last year's starters were back in the lineup this year. But start factoring in injuries and this year's Jaguars team takes on a whole different look. Four offensive starters -- WR Marqise Lee, OT Cam Robinson, TE Seferian-Jenkins and RB Leonard Fournette -- are either out for the season or have missed considerable playing time. Defensively, the only starter who has missed any games is cornerback A.J. Bouye, who sat out against Philadelphia. So where does the blame fall for the skid? Ask Marrone and he'll point his finger at one person -- himself. "I've done a poor job communicating," Marrone said Monday afternoon. "I think if anyone is going to look at the team and why the team is doing poorly, the first person they have to look at is me. I'm not trying to be a martyr, I'm not trying to be a shield or anything like that. I just really believe that I haven't done a good enough job for whatever reason to get everyone's mind in the right place. And that does start with me." One phase of the Jaguars' offense that has been perplexing is the team's penchant to discard the running game and go with a pass-heavy attack. The Jaguars called for a passing play on 39-of-41 second half plays from scrimmage. Six times, the Jaguars needed either one or two yards for a first down and on all six occasions they called for a pass. Quarterback Blake Bortles was 0-for-5 and on the sixth play, he couldn't find a receiver and scrambled four yards for the first down. "We thought the best way for us to move the football was to throw it," Marrone said. "But those are things that you look back on at, and it's, 'Can we do a better job of that [calling plays]?' Absolutely." What's surprising, is that with the powerful Fournette having missed four straight games, the Jaguars went out and traded for the Cleveland Browns' top running back, 240-pounder Carlos Hyde. Hyde had just six carries against the Eagles and gained only 11 yards. "We've got to do a good job getting him involved, getting him comfortable with the system," Marrone said. "I think Carlos is going to be able to give us a boost here in the second half." What would give the Jaguars a bigger boost is to get some of the injured players back on the field. "I won't know until we get later in the week," Marrone said of his injured players. "Until I see them [running around in practice], everything to me is questionable." CB Quenton Meeks, who earned his first NFL start in the Philadelphia game, suffered a sprained knee and was seen with a brace on his leg and walking with crutches in the Jaguars' locker room on Monday. PK Josh Lambo attempted his first field goal in four games on Sunday. After not attempting one in the last three games, Lambo converted on all four of his field goal tries against the Eagles. He now holds the franchise record of 23 consecutive field goals made. CB Jalen Ramsey grabbed his first interception of the season with a first-quarter grab of a Carson Wentz pass in the end zone. Last year, Ramsey had four picks en route to a Pro Bowl season. QB Bortles was 16-of-22 for 175 yards in the first three quarters, then hit on just 8-of-19 throws for 111 yards in the last 15 minutes. 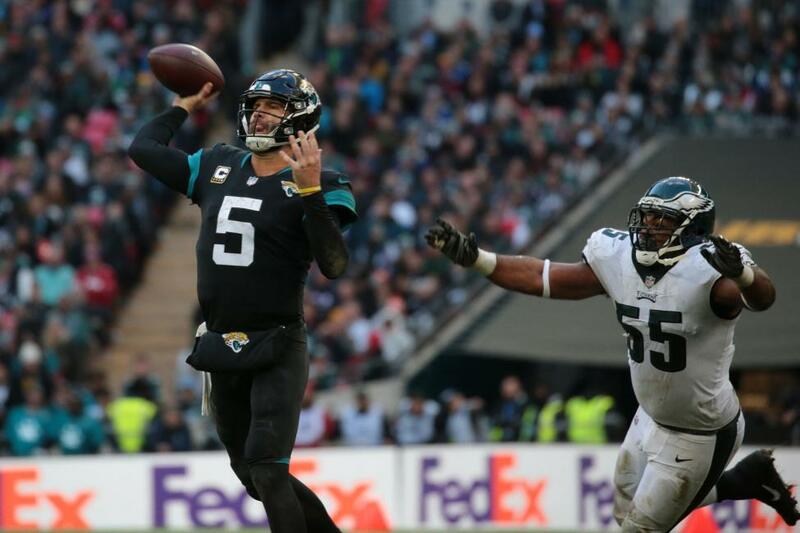 The 58.5 percent completion rate for the game marked the fourth straight game and the fifth this season that Bortles had failed to complete 60 percent of his passes. WR Dede Westbrook had the Jaguars' longest punt return of the season with a return of 24 yards to set up one of Lambo's four field goals.